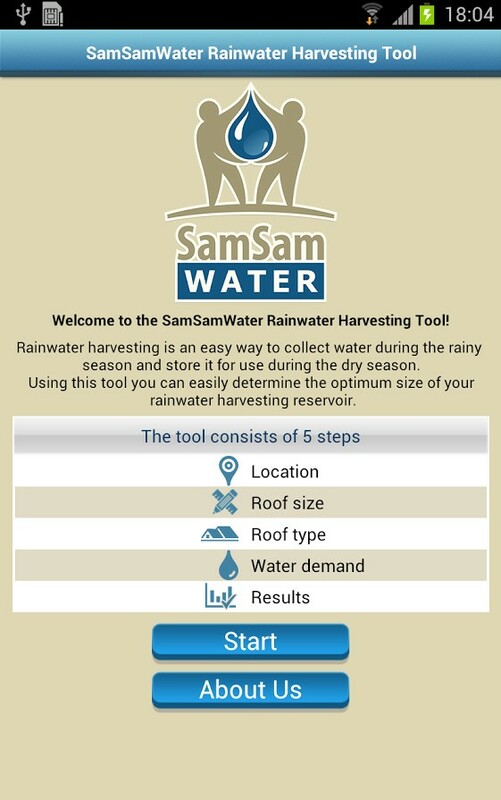 SamSamWater launches the Rainwater Harvesting Tool. The Rainwater Harvesting Tool is a free online tool enabling everybody to easily calculate the optimal dimensions of a rain water harvesting tank for any location worldwide. Visit http://www.samsamwater.com/rain or download the free app from the Google Play store (https://play.google.com/store/apps/details?id=com.b24.samsamwater). Catching and storing rainwater from rooftops (‘roofwater harvesting’) is a proven technique which can provide a safe source of (drinking) water. Despite it being a commonly practiced method, many tanks (reservoirs) of roof water harvesting systems are over- or under-dimensioned, making the system unnecessary expensive or providing insufficient water. The rain water harvesting tool will help consumers, engineers and NGO’s to determine or check the optimum dimensions of a rainwater harvesting system. In four easy steps you can calculate the optimum size of a rain water harvesting tank for your home, school or nursery. Based on your location, the available monthly rainfall is retrieved from a worldwide meteorological database. By entering the size of the roof (or drawing the roof on a map) and the type of roofing material the tool determines the amount of water that can be harvested. Finally, by entering the number of people using the system the water demand is calculated. Based on the monthly water availability and demand, the tool will determine the optimum tank size and will also give information on the expected reliability of the water supply system. The results are presented in a simple way so they can be used in for example project proposals or reports. If you have questions, suggestions or if you would like more information on the SamSamWater Rainwater Harvesting Tool please contact us.